Sandwiched somewhere between macho, tough guy and eccentric 3rd grader lies the personality of Basile. On one hand he"s an imposing presence on stage commandeering the microphone and issuing "you must laugh" edict to the audience. On the other , he boasts numerous cartoon voice-over credits, including Bullwinkle J. Moose and characters from Disney films The Lion King, Aladdin, And Beauty and the Beast. 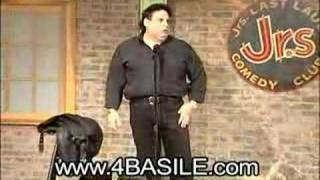 Basile has appeared on MTV, HBO, Comedy Central, and Showtime.